So my second part of how to achieve a fully automated deployment, can be used to create a reference image or to deploy a computer. In my case I have set the priority on MACAddress first, this means that MDT will look for a machine with the given MACAddress and apply the custom defined properties only for this machine. This is especially handy when we want to use our deploymentshare for more then one purpose alone. In my case the ability to create an automatic reference image but also being able to use other task sequences from that same deploymentshare to other computers. So if we specify our MACAddress here, we can then apply the settings we want. In my case I start again with configuring the IP address for a virtual machine which occurs in a back-end server environment with no particular DHCP present on the VLAN. Next we need to provide an computer name for our reference build. With the SkipComputerName=YES we prevent the hostname wizard, but when we do this, we also need to provide an hostname for the upcoming deployment. The task sequence variable “OSDComputerName” will be picked up and understood by the scripts if provided. SkipCaptures=YES obviously the wizard pane needs to be skipped. But because we want to capture our reference image, we provide the DoCapture=YES setting too, followed by the backup location which needs to point to an accessible network-share and provide the file-name for the captured WIM file. So far our custom properties for one particular fully automated Task Sequence. When all the other configurable options will remain the same we can configure these options beginning with the organization name displayed during deployment. The organization name displayed can be modified by providing the parameter “_SMSTSOrgName” and a value for the organizational name, for example “Contoso IT”. 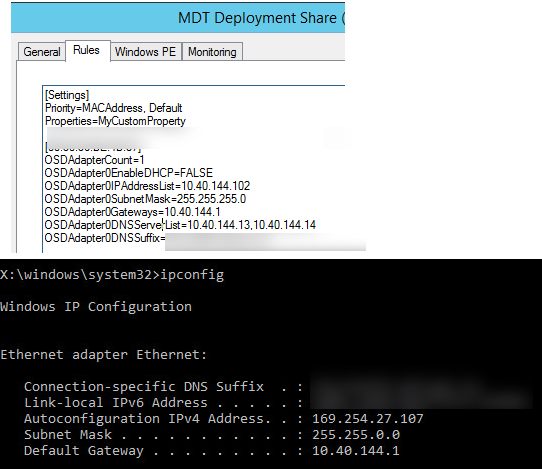 Further, OSInstall lets MDT know we want to deploy and operating system. The following options are for preventing the multiple wizard panes popping up for input or requesting input. At default, we don’t want the Task Sequence wizard to skip, therefore we set this setting to “NO”. With SkipApplications and SkipAppsOnUpgrade we can see the apps that will be installed if the Application Guid has been provided in the customsettings.ini. Once again, Andrew Barnes has written a nice blog about that particular subject. Skipping the capture, makes sure that your deployment will not ask you to start capturing at the end of the deployment and defining the property DoCapture=NO answers the question that your deployment will not be captured. A new addition to my customsettings.ini (which I have added december 2013) is setting the native resolution for each device, by providing the following settings, the machine will be forced to start “enable auto detection” of display settings. This way, you’re always getting the most optimized resolution settings for your device. See this blog for more information. “SkipBitLocker” will show the Bitlocker configuration pane during deployment, and the last of the regular wizard panes “SkipSummary” wil not show the configured properties of which the deployment will commense with after we have clicked next. Supplying the eventservice, makes sure that live monitoring will be reported back to the MDT deploymentshare at which current step your deploymentphase actually is. Providing the value “SLSShareDynamicLogging” provides actual replication of the BDD.log which covers all the actions executed by the task sequence and is a nice feature for centrally logging the deployment progress! In the end, using “HideShell” makes the Windows 7 GUI disappear and only the MDT progressbar visible for the length of the deployment. In the end we specify which WSUS updates will not be included in the update process. Because enabling the two steps already present in the task sequence “Windows Update (Pre-Application Installation)” and “Windows Update (Post-Application Installation)” will start querying your WSUS server or Windows Update Server on the internet and download all available Windows update present at that time. To exclude certain updates we can first of al run a /query from which we can easily see which updates are being advertised to our computers. By providing the following additional command: “/query” to the already existing command: “cscript.exe “%SCRIPTROOT%\ZTIWindowsUpdate.wsf”” we can see in our BDD.log which updates are being advertised to the system. Note that each update that needs to be excluded needs to be specified seperately, and numbered each time with a higher number for every new to be excluded updated. Hope that this provides some insight in creating a fully automated reference image and explains the purpose of each property in the way that I have experienced it. Hi, I have a quistion. When I try to deploy an OS to a machine , it Always installed the English version of Windows 7 and I want it to install the Dutch version. What do i have to change in my settings and where ? First keep in mind deploying OEM is officially not supported by Microsoft, unless you work for DELL, HP, or have a OEM vendor agreement like large retail company’s who ship out computers. Dank je wel voor de tip. Het heeft helaas niet gewerkt. Wat wel werkte is LanguagePacks001=nl-NL. Dit gaf daarna een foutmelding na de deployment dat het LP nioet gevonden kon worden. Nadat ik dit had geimporteerd in MDT onder packages werkte het wel. Dit had echter als nadeel dat ik weer een package extra had in mijn deployment. Ik heb het nu als volgt opgelost. Van de MSDN Site de NL versie van windows 7 gedownload en die als distributie gebruikt. De reden waarom ik in eerste instantie een OEM versie gebruikte is de volgende. Wij (valksoftware) maken kassa systemen voor Retail gebruikers gebaseerd op een NL versie van Windows 7. Wij hebben dus een magazijn vol met Dell Systemen waar een OEM licentie bij hoort. Nu maak ik dus de image van de MSDN DVD en na afloop wijzig ik het nummer van de licentie die op de sticker staat op de PC. Ik hoop in de toekomst “als het mag” dat ik wat vaker een beroep op je kan doen als ik vragen heb over MDT. Wij willen graag dat de computernaam automatisch word meegenomen en ik wil graag dat ik een capture image kan maken ivm. Updates? Elke keer als ik een capture doe dan herstart de computer. Zou jij me hier mee kunnen helpen? thank s for you post! really great and commented! each time i’m trying to capture via this task, i see that the process skip all the times the sysprep and capture phase and goes directly to MDT DO NOT ENABLE OR DELETE – and after the deployment siummary prompt shows succes without erroes or warnings. I have some others deployments task sequences which work perfeclty! I get this trouble since i’ve migrate from MDT 2010 to MDT 2012 sp1. Please give me a solution 3 days without fixes…..
Also I see you have your [other] and [default] section, missing the left “[” perhaps that just happened copying the cs.ini on my blog. And I see you do not have specified your [other] section at the priority property. What you can do is specify the properties as a task sequence variable in your Sysprep and Capture task sequence. If all fails, please send me your bdd.log which you can find in C:\Windows\Temp and smstlog which you can find in %localappdate%\temp through mail. Thanks for your willingness to share! I plan to return often. I’m having the following problem in automating my deployment using MDT and WDS. When I create (or update) my LiteTouchPE_x64.wim and upload it to WDS, the changes aren’t there when I start the deployment via PXE. But when I start the OS and use the LiteTouch.wsf it works like a charm. The path to the boot wim in MDT is E:/DeploymentShare/Boot. The path to the boot wim in WDS is E:/RemoteInstall/Boot/x64/Images. I even tried a file copy to make sure the file was correct but it didn’t help. I’m not understanding how the boot wims being used could be different? Am I missing something so basic?? Thanks for giving a reply. Did you import the WIM files in WDS? Or just put the files in the designated “RemoteInstall” folder? Because they really need to be imported into WDS through the MMC / Gui. The reason why it is different, is because if you call Litetouch.vbs from a desktop running Windows, the connection with the deploymentshare is made through the script, which in it’s turn, reboots the machine and offers the WinPE file. While doing it with WDS the WIM file from WDS is used. I did import the new wim into WDS (each time I recreated it) but when that didn’t work, I tried the file copy. Neither seems to get me the correct wim when I boot using WDS PXE. I’m stumped? It seems like WDS is sending an old wim that hasn’t been updated through the import process, it’s just using the same old one every time. I feel like a path is incorrect somewhere, I just can’t figure out where? Two things I should try, erase every boot image in your WDS, perform a search after that in your RemoteInstall folder for *.WIM files there shouldn’t be any left which match the size and description of your prior imported boot images. Another thing I once encountered was the machine holding settings of an old bootfile. Therefore, perform a “DISKPART > SELECT DISK 0 > CLEAN” action running from a command prompt within WinPE on the machine to entirely wipe the disk and know for sure you aren’t being messed around with by MDT/WDS. That’s all I can think off. I did everything you suggested, deleted all wims from WDS, searched and found no remaining files in RemoteInstall folder, then ran diskpart on machine and I’m still getting the old wim file booting from WDS PXE. I feel like I’m taking crazy pills! It’s got to be something simple I’m missing. I’m going to create a new deployment share and try it all again from scratch, uploading from an entirely new location. THANK YOU for your time! I’ll let you know how it works out. I wouldn’t bother creating a new deploymentshare, I’d go for disabling the WDS role, delete the RemoteInstall folder and reconfigure WDS. Since WDS is the transport system for your Boot image. This isn’t MDT. Does anything in my files look bad? I’m thankful for your help!! So that’s it. What exactly was the change between boot images? Modifications in the bootstrap.ini or added drivers? Notice that every change in bootstrap.ini means the need to update your deployment share, so the bootstrap.ini which is embedded in the boot.wim is updated. This is exactly the same for drivers that are needed into your boot image. Great news, it looks to be working. I added the SkipBDDWelcome=YES to the bootstrap.ini and that appears to have done it. I wonder if/why it has to be in both scripts, but it’s time to move on. Now all I have to do is wait to see if it finishes correctly. THANK YOU so much for your help. I’m just beginning to learn MDT/WDS, and tomorrow I start looking into SCCM so that we can start pushing patches, updates and drivers without touching every machine or completely re-imaging them. I have 700 PC’s in two schools to be re-imaged by mid-August. We’ve got about 10 different hardware platforms and 15 images in our old system (FOG) to transition to the new way of doing things. I wonder just how much customization I can do to bring down the number of images and how well the patching is going to work. Certainly have my work cut out for me :-). I’ll b a regular visitor to your website from now on!!! Gregg, SkipBDDWelcome only needs to be present in your bootstrap.ini, you can remove it in the customsetttings.ini. Regarding your number of images, MDT as well as SCCM provides the tools/mechanism to create one image to deploy to all of your hardware. For driver management, have look at this article http://deploymentresearch.com/Research/Post/325/MDT-2013-Lite-Touch-Driver-Management which pritty much explains everything on how to achieve OS deployment with one image for multiple hardware devices. Glad I’d could help, and thank you for your appreciation. Where to find local codes for other countries for example Sweden. You can find the codes in the following two files: ListOfLanguages.xml and DeployWiz_LanguageUI.xml located in the .\DeploymentShare\Scripts folder. If you scroll trough the XML file, you can find all the codes, timezones and locale’s that you can or may enter through the wizard, these values are also accepted when you provide them directly into the customsettings.ini. Hi Rens, thanks for this helpful blog post! I just have a question you may be able to help with. I do not have DHCP available, so I put the static entries in my cs.ini and rules files as you wrote above. The IP config works fine once booted into Windows, but in WinPE at start of deployment, and then the final capture stage it applies all settings like gateway, dns servers etc except the IP and subnet addresses, which stays set to “Autoconfiguration IPv4 address”. I can set the IP manually via netsh again, but the goal was to have this all automated. I wonder if there is some other setting I need to check with my config if you’ve come across this before? I am using Win10 ADK (RTM build) with MDT 2013 Update 1 on a Win2012 R2 server. Sorry for my late responce, strange that you lose the IP configuration in the WinPE phase, because that is the place where the configuration is initially set. I’ve not yet encountered this. So I can only recommend you to view your logs (also the logs in and during the WinPE phase) view them with Trace.exe or CMtrace.exe. In the logs you may see if, how and when the adapter has been appointed an address. We have 2 sites, site A and site B. Site A is our main site with MDT and WDS and also DB linked to MDT for deployment of specific Drivers or applications base on Make and Model. I need to be able to image computers on SITE B which is our remote site connected to our network via 100Mb Wan connection. Since the number of computers in Site B are lot less than ours , I decided to create a USB bootable Media for them so they can Image their laptops. I need their computers to be able to connect to my DB on Site A to just get the Make and Model information, but the rest should be running from the USB drive locally. The question is what should I put in CS.ini and Bootstrap.ini for the USB Media so it will work properly? Clever solution you’ve got there. I think you’ll need to provide everything, except the path to your deploymentshare in the bootstrap.ini. When you create offline media, your template bootstrap.ini is almost completely empty. It has no referrals to the share. So you should leave those out. All other properties like DB settings, should be in the bootstrap.ini and customsettings.ini. And also pretty obvious, the Database servers needs to be accessible from the remote location Site B.
I have a problem, when i auto signin my MDT to the deploymentshare i don’t see any Task Sequences. But when i clear the auto signin it shows all the Task Sequences. That’s some strange stuff going on there. So if you provide settings in bootstrap.ini you don’t see them, and if you enter them manually, you see the task sequences. My first guess would be to check your permissions. The MDT account both needs NTFS and Share permissions. Also please view your logfiles in WinPE during the initialization phase to see what is going on. Keeping the domain joining admin password with in the customsetting file is something we want to avoid. As an alternate we can use the Task sequence to provide the domain joining OU and credentails But this does not work in Refresh scinerio. Is there any other alternate way available? Did you use task sequence variables to supply domain join credentials? You may also use custom scripting so the credentials are not used in the customsettings.ini, or use a different customsettings.ini per specific deployment. Just some options. A lot of great tips on your blog, it’s really appreciated. 1. I need to pre-populate computer names, so the technician who installs the image can choose a name from a drop down. Do I need to use the MDT database or can I script this somehow? Thanks appreciated you reaching out to me. You can use either a database connected to MDT or, you can provide a prefix. Most hostnames consist out of an abbreviation of the organization followed by a number and perhaps a distinction between desktops and laptops. So lets say: CONTOSO is the name of the company, you can work with a ByLaptop ByDesktop subsection, if the machine is a Laptop, the prefix will be: OSDComputerName=CNTS-LT and if it’s a desktop it would be CNTS-DT. This way your support technician would only have to fill in the number. Providing a list isn’t flexible for hostnames. Then I would advise the database, but be aware this requires hardware information from the machine, such as mac-address, serial number, asset tag or UUID. These values should be predefined except tha last one, there should always be a +1 increment according the the values already in AD. I can’t really seem to wrap my head around how to accomplish this using Mikael’s customsettings.ini wizardry. Is the MDT database the solution for this scenario? I would lose the dashes or just have one dash (-). Loving the details in your work. this might get a little ugly. I hope you are able to follow the bouncing ball i am about to present…. I have a different scenario and i am having trouble isolating a solution. I am tasked to try to reduce the number of times the image process requires to be touched by the deployment team. *In the domain joined TS, the agent will not install unless an administrator is logged in (we disable to domain\administrator account so the TS fails to auto login to finalize the installation) There is no issue with this on the workgroup machine because it isnt trying to authenticate a domain account to do the install. I need to be able to (somehow) boot, run a specific task sequence which installs a specific image (and software) with the deployment team only running one step (i.e. they kick off the image process for either an Office or a Field image and when they return it is 100% complete without ever touching it again). Am i completely out to lunch thinking i should be able to automate this from start to finish? Is there something like a unique value for you to work with? Say certain Dell machines will always receive image A and others image B? This can easily be implemented by using a “Model” subsection in your customsettings.ini and put the “Model” priority before the “Default” priority and subsection. The way how I build my deploymentshares nowadays is with task sequence variables for the domain join embedded in the task sequence. So other task sequences (where machines are not to join the domain) aren’t troubled with obsolete information in the customsettings.ini. Auto-logging in can be prevented for example by adding the HideShell=YES in your customsettings.ini and FinishAction=LOGOFF, this way during deployment the explorer shell isn’t loaded and at the end of a deployment tasks executed by a agent can be performed. Ideally you would want to disable auto login elsewhere. If you add a reboot to your task sequence in the State Restore step, or set it as a FinishAction, basically it tells your machine to set the autologon properties just one more time. How do you deal with computernames? Because If you want to make it 100% fully automated, consider implementing a SQL database (MDT has integration for it) so you can import computers, create a relationship between computername and mac-address or serial number, or uuid or asset tag, and then tell your machine: which name it has, which task sequence to run. This has some work upfront but in the end this will help you immensely. So there are some things for you to think about worth implementing! It seems having a unique identifier is my challenge to try to automate this process. All pcs are Dell (yes, we have different models but we dont specify which model goes where – any model can be deployed any where; office or field). We have a reboot in the POST INSTALL section just prior to the State Restore section. Should i remove that to allow the application to install with the shell hidden? Do you think having 2 deployment shares (with two CS.ini) would be the easiest? the only thing…. how does the PC know which deployment share to access? Toevallig was op zoek naar een oplossing van mijn probleem op het net zag deze site ik zal even uitleggen. Ik heb een simpel MDT, hoe kan ik de laatste optie skippen, want in de applicatie keuze geef ik aan welke applicatie wil ik deployen, want na de action install OS komt het wizard weer naar voeren en die wil ik niet hebben. hier geef ik aan dat ik bv office en zo wil deployen. maar dez optie wil ik niet hebben en de applicaties die ik aangevinkt heb wel geinstalleerd hebben. De opties SkipApplications=YES en SkipTaskSequence=YES laten de applicatie en tasksequence selectie pagina niet meer zien. Bedankt voor snelle reactie ik ga vandaag proberen nogmaals bedankt. Ik wil wel de keuze hebben om de applicaties te selecteren die je wilt installeren “https://imgur.com/a/ED9AO” dit wil ik hebben, maar na install OS doet ie rebooten en komt ie weer met deze TS https://imgur.com/a/eW9qr en deze stap wil ik geautomatiseerd hebben eigenlijk ik heb al aangegeven in eerste TS dat welke applicaties wil ik hebben.